I’m a slow spinner. I spin on a spindle, and some would say that I should switch to a spinning wheel in order to spin more quickly. But I know spindlers who are very productive. I think it’s more a matter of my not making spinning a priority. I was given more than a pound (453 grams) of wool roving in 2012 or 2013. It had been passed along a few times before landing in the hands of a spinner. I know that it’s wool but I don’t know what type. It’s scratchy and knotty, and the original colors ranged from off-white to deep charcoal. I have my doubts on whether it would be considered worth spinning by those who have a deeper understanding of fiber quality. If nothing else, it had potential as practice fiber. Early on, I decided that I didn't like the colors. While I appreciate grays, these had a yellow cast that made the fiber look dirty. So, each year after my children dyed their Easter eggs, I dyed a little of the wool with the leftover dye. I used whatever dye we happened to buy for the eggs each year, which made the colors similar but not the same. The one-color yarns. 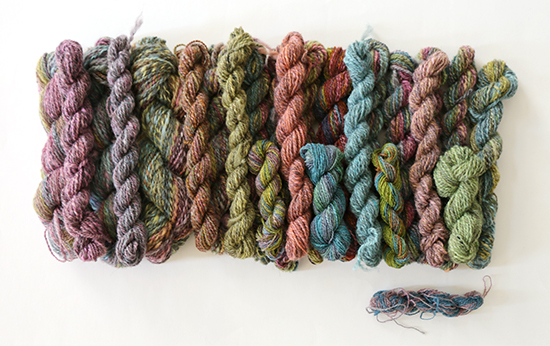 The skein to the top right was spun from random colors for an almost-solid brown. I started out by spinning some of the dyed fiber each year, varying the process each time. The yarns range from lace to bulky weight. I spun most of the wool semi-worsted, but one lumpy skein is the result of trying to spin woolen despite the knots in the roving. Some yarns are a single color, some are two or three colors, and many are a full rainbow. For most of the yarns my goal was to align the colors of the two plies, but for a few I spun and plied randomly. My spinning stalled as I tried to think of what I could make with such a hodgepodge of colors and weights. If I could come up with a plan, I could choose a consistent method for spinning the last half of the fiber. 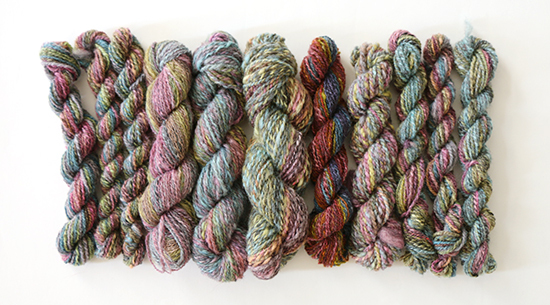 I have no idea which dye we used the year I achieved the vibrant colors in the middle skein. Then it happened: I latched onto a project idea. From then on, I needed to finish spinning the fiber so I could cast on as soon as possible. I’ve spun as much of this wool in the past two weeks as I did in the previous five years. I’m going to leave you in suspense regarding the project, although I suspect it won’t be for long; I started knitting a swatch before the last skein had dried. It’s a simple pattern and, with less than 1,000 yards (914 meters) on US-8 (5.0 mm) knitting needles, it should work up much more quickly than my usual spinning pace. What inspires you to finish a long-running project?